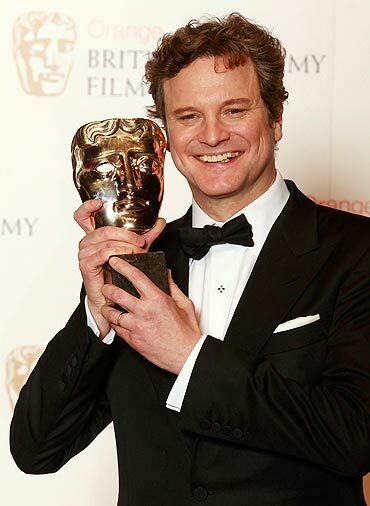 The King's Speech made a clean sweep at the 2011 BAFTAs, held at the Royal Opera House in London on Sunday night. It won seven awards out of 14 nominations, including Best Film, Outstand British Film, Best Actor (Colin Firth), Helena Bonham Carter (Best Supporting Actress) Geoffrey Rush (Best Supporting Actor), Original Screenplay (David Seidler) and Original Music (Alexandre Desplat). In his speech, Firth, 50, thanked the film's director Tom Hooper, praising his 'thorough, surprising and effective' ways of working and his family for 'remaining so steady whether they are dealing with a dancing queen or a sometime king'. Alexandre Desplat, who bagged the Best Original Music for his work in The King's Speech, scored over A R Rahman, who was nominated for his music in Danny Boyle's 127 Hours. 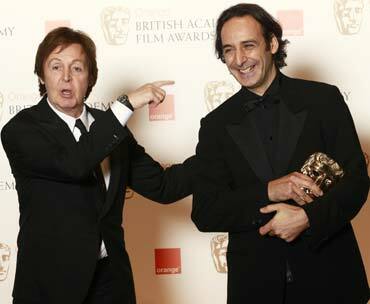 Here, Desplat shares a laugh with Sir Paul McCartney. The Harry Potter film series bagged the Orange British Academy Film Awards for Outstanding British Contribution to Cinema. 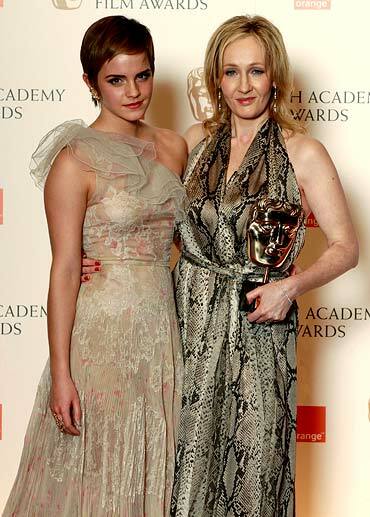 Arthur J K Rowling showes off her award, as she posed with Emma Watson, who plays Harry's best friend, Hermione. Incidentally, Emma had a wardrobe malfunction at the pre-BAFTAs party. The actress was wearing a short navy blue silk dress with a plunging neckline, when the tape got loose and Emma exposed more than she intended to. Natalie Portman bagged the Best Actress award for her work in Black Swan but the pregnant actress did not make an appearance at the awards show. 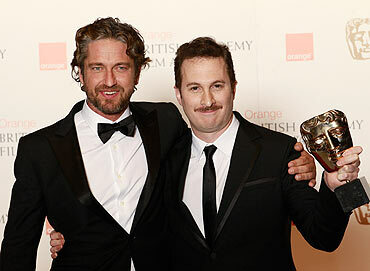 Scottish actor Gerald Butler and the film's director Darren Aronofsky received the award on her behalf. Women in blue make the BAFTAs look hot!